These pages aim to respect the memory of football league players who played, managed or otherwise featured in England in the period from 1965/66 to 1979/80. It will list the players whose deaths are known. If you can provide confirmed details to update this page please email me. Figures in brackets after teams represent the number of league appearances made, where known, mainly sourced from Wikipedia and Rothmans Football League Players Records. Atalanta (78), Juventus (377). Italian defender who made his Italian league debut in 1972, and his international debut in December 1974. Played in the 1978 World Cup in Argentina, Italy winning through the group stages but coming second to the Netherlands in the second stage. Italy lost the third place match to Brazil, 2-1. Scirea played again in the 1982 World Cup in Spain where Italy only just scraped through the group stage before going on to win the World Cup with a 3-1 win over West Germany. Scirea's last World Cup was 1986 in Mexico where Italy won through the group stages but lost to France in the Round of 16. Scirea was ever-present for Italy throughout these World Cup final tournaments. The FKS Argentina 1978 sticker album records 'Plays the sweeper role for Juventus and was originally with Atalanta. Four seasons with his present club ahd has been capped at Under-23 level and five times by the full side. Scirea was tragically killed in a car accident in Poland in 1989 while on a scouting trip for Juventus. Legia Warsaw, Manchester City (38), San Diego Sockers (90). Died in a car accident in the U.S.A. The Bassett's 1974/75 card notes "Deyna is a midfield player who has plenty of flair. He is the schemer for Legia Warsaw and was voted player of the year. He has almost reached the half century of caps... A certainty for the world cup team and bids to be one of the stars of the series in Munich." Aston Villa (226), Birmingham City (30), Torquay United (11), Oldham Athletic (2). The 1966/7 A&BC card states "Aston Villa centre half. The son of a Dutch paratrooper, John has been with Aston Villa throughout his footballing career and has developed into one of the most polished centre halves in league football. Rarely scores goals but is behind many of Villa's best moves. Height 5' 10". Weight 10st. 6lbs." Orient (75), West Bromwich Albion (86), Real Madrid, Marseille, Manchester United (5), Sporting Gijon, Leicester City (15), Real Betis, Charleroi, Wimbledon (6), Rayo Vallecano. First black player to represent England in a competitive match. 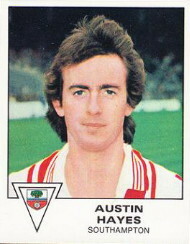 Transferred to Real Madrid in 1979 for £995,000. Killed in a car accident in Madrid. The FKS Soccer Stars 80 sticker notes "Signed in March 1977 from Orient at the cost of £100,000. Forward born in London of West Indian parents and an England Under-23 cap in recent seasons." Leicester City (96), Hull City (76), Manchester City (162), Sunderland (64), Leeds United (76). The Rothmans Football League Players Records book notes " Came to the fore as one of the vital links in Manchester City's deep lying centre forward plan of the 1950's, which really reflected the way that the Hungarians were playing. Before that Don had begun with Leicester City, unfortunate in missing the 1949 F. A. Cup Final against Wolves due to injury. From there the call came to help Raich Carter rejuvenate Hull City, going on to Maine Road in 1951. After a less than auspicious start, the advent of Bobby Johnstone from Hibs created the link needed to produce 'the Revie plan'. One winning Cup Final medal in 1956 must have compensated for a losers medal against Newcastle the year previous. 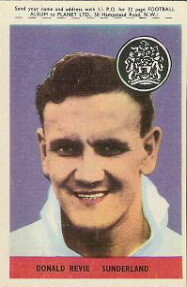 Revie, after calling in on Sunderland, moved on again to become player manager at Leeds United ". Southampton (61). Was seriously injured in a car crash in 1976 and didn't play for Southampton after that. Died in 1988 after a battle with leukemia. Established a charity which has helped fund the Steve Mills Stem Cell Laboratory at the Southampton General Hospital. Bradford City (97), Nottingham Forest (73), Newcastle United (52), Birmingham City (196), Sheffield United (68), Norwich City (13), Aston Villa (24). Died of a heart attack while participating in a five-a-side tournament for charity. The Top Sellers Football 72 cards states: " Signed from Birmingham City for more than £40,000 last season. Hockey is a skilful forward who now often plays a midfield role. Born in Keighley, he played for Bradford, Nottingham Forest and Newcastle before joining Birmingham. On the small side at 5ft 6in. but very quick to see an opening ." Darlington (213), Hartlepool United (8). Southampton (31), Millwall (47), Northampton Town (64). Died from lung cancer, three weeks after having been diagnosed. The FKS Soccer Stars 80 album notes "Centre-forward who turned professional in July 1976 and made his initial senior (Southampton) appearance the following season. Made more progress in 1978-79 and won Eire international honours. " Sheffield United (28). The 1974/75 FKS album notes "Was given his initial outing in the first team during 1971/72 season making his debut against Coventry City in November 1971. Had only one other senior opportunity that season. Full-back who hails from Mexborough and has had few chances. Height 5ft 7in. Wt. 10.8. " Brentford (42), Arsenal (210), Birmingham City (122), Brentford (44), West Ham United (8), Plymouth Argyle (25), Orient (44). Later moved into management with Orient, Leicester City and Luton Town. Died after suffering from cancer (this website previously said 'heart attack', but this has been kindly corrected by his son). The 1966/67 A&BC card notes "West Ham inside right. A clever ball-playing inside forward, Jimmy joined the "Hammers" last season from Brentford. Started his career with Brentford, and was with Arsenal and Birmingham City before moving back to Griffin Park. Height 5' 10". Weight 10st. 12lbs. " Q.P.R. (405), Bolton Wanderers (33), Fulham (18). The 1973/74 FKS album states " Full-back who was developed by the club's juniors and is another ex-England youth cap. Was introduced into the first team in 1966-67. Likes to link up in attack too. Completed his 200th League outing last term. Height 5ft 10in. Weight 11.5 ." 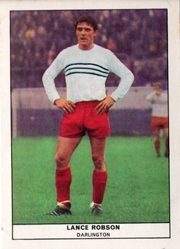 Romanian defender who played for Rapid Bucharest from 1961 until 1971, then moved to Belgium to play for Antwerp F.C. Made 41 international appearances for Romania, including at the 1970 World Cup in Mexico. The 1970 FKS Mexico World Cup album notes: " Experienced 29 year old who usually plays in the centre of defence for Rapid where he displays strong destructive qualities. Among his 39 full caps he has 1966 World Cup qualifying games as well as the 1970 series ". Preston North End (72), Sunderland (73), Blackpool (3). The 1976/77 FKS sticker states "Joined the club (Sunderland) in the 1975 close season for £100,000 from Preston North End where he had ended the term as top scorer with 23 League and Cup goals. Striker who took time to settle on Wearside after his arrival. Height 6ft 1in. Weight 10.4.". Arsenal (25), Norwich City (236), Colchester United (20), Scunthorpe United (10), Crewe Alexandra (4). Found drowned in January 1980. The 1972/73 FKS album states "This former youth international was winger once and now occupies a midfield role. Signed from Arsenal in February 1965 he has also appeared at centre half occasionally. Played more than 200 League matches. Height 5ft. 9in. Weight 11.4."